Star Wars fans worldwide are saddened today to learn that Richard LeParmentier has passed away at the age of 66. LeParmentier was an American residing in Great Britain, and making quite a career for himself as a television and film actor. And then the fickle finger of the Force (along with a casting director and George Lucas) chose him to portray Admiral Motti in what became Star Wars Episode IV: A New Hope: the film that started it all. It is Motti, you will remember, who is the first person we ever see getting on the business end of Darth Vader's "Force choke". Motti had been boasting of the Death Star's destructive power while mocking Vader's "sorcerous ways" and his "sad devotion to that ancient religion" when the Dark Lord of the Sith chose to give Motti a first-hand demonstration. 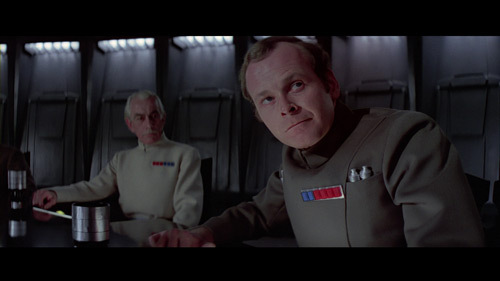 Fortunately for Motti, Grand Moff Tarkin told Vader to cool it and let go of the arrogant admiral's throat. LeParmentier was in only two scenes of the movie, but he made an immortal impression upon all who have enjoyed the Star Wars saga through the decades. I got to meet Richard LeParmentier twice: at Dragon-Con in 2001 and then at Star Wars Celebration II. He was a very nice guy, and exceptionally happy to make time to meet and greet his many fans. Thoughts and prayers going up for his family.